This post is Part 8 of a series to augment the Atlas of the Known World available for free download. Start with Part 1 here. Farmland of elves and gryphon riders. 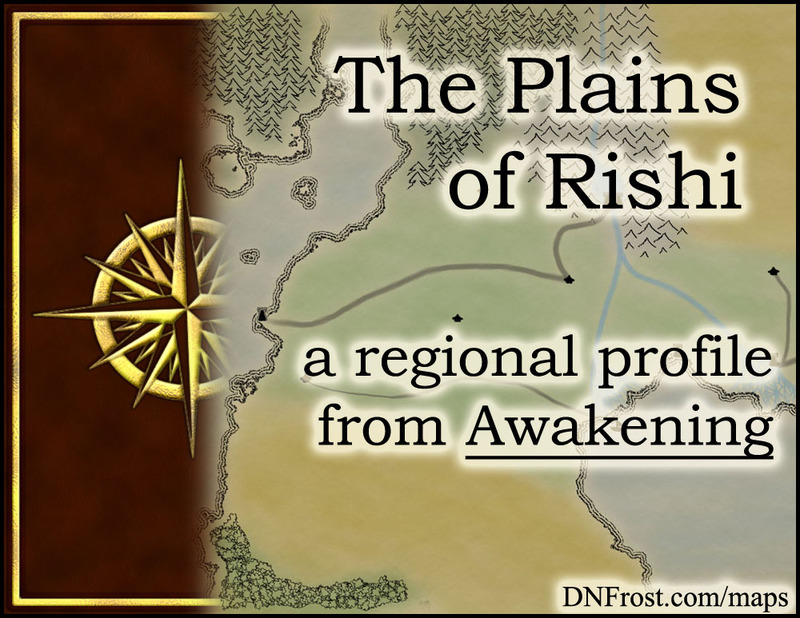 You voted The Plains of Rishi winner of February 2015 by 77%. In Part 2 of Awakening, the Plains of Rishi stretch from the western Great Sea to the eastern Katei Ocean. These flat windswept lands are sunny and temperate, with mild winters that make for long growing seasons. Two large river deltas split the Rishi, providing fertile silt to its great tracts of farmland. The Front Rishi lies in the west, south of the black pine Forests of Kalrein and north of the cursed badlands of Old Ryerin. The Back Rishi lies in the east, forming the escarpments that border the arid Sutek Desert. Many wild grasses grow across the Rishi Plains, but most of the land is devoted to agriculture. Wheat, oats, and barley are farmed in the drier soils, and the soggy land nearer the deltas is home to many successful rice paddies. A healthy ecosystem of insects thrives across the Rishi, supporting an array of larger animals, including both wild and domestic wvyern herds that roam vast acres of untilled ranchland. The top predator of the Rishi Plains is the gryphon, nearly extinct in the wild but domesticated by a dwindling population of gryphon riders. While the bustling cities of the Rishi are home to many races, the predominant people are the plains elves. The darkest of the elf races, the plains elves are well-tanned by the constant sun and sport dark hair and eyes. Like most elves, their ears are long and backswept, and though they are strongly allied with the mountain elves to the north, they do not perpetuate the mountain feud with the faeries of Kalrein. However, plains elves do typically harbor disdain for the blond tree elves who dwell in townships along the borders of the badlands. A fairly destitute race, tree elves find little opportunity for advancement and usually live humble lives of meager subsistence in the unclaimed borderlands, unless they've signed into indentured servitude upon a wealthy Rishin farm. The plains elves access a potent cocktail of sensory and special magics, but are very weak elemental mages. They usually display decent abilities with Animal magic, and are renowned for their Metal magic and smithing prowess. Their Sound and Touch magics are usually quite good, and plains elves manifest a relatively high percentage of rare Music mages, whose skill with melody and rhythm can literally enchant listeners into an obedient thrall. Though still rare, the prevalence of Music mages has led to a strong madrigal tradition across the Rishi, and within the wandering minstrel groups that roam from town to town, it is not uncommon for one or more bard to display the rare ability. Rishins tend to take a rather practical outlook on life, and value traits such as hard work, rationality, and thriftiness. While education is readily available at no cost, the expectation is for students to increase their earning potential and ability to manage wealth in a practical manner. Magic is also seen as a practical means to an end, and is usually viewed as an ordinary part of everyday life, with very little symbolism or meaning attached to it. As one of the regions of the Allanic Empire, the Plains of Rishi fall under imperial law, but each town or farm issues additional local ordinances that are usually enforced by those in the employ of the area's wealthiest family. Families are aristocratic and tightly knit, and land is usually passed down to the first-born son or daughter while family wealth is divided amongst siblings. Despite their elevated social status, plains elves have a fairly laid-back etiquette and are unlikely to take offense at crudeness or breach of social norms. The most effective insult is likening someone to a lowly tree elf, but even this is usually brushed off with a scoff and a roll of the eyes. Plains elves use a version of the mer calendar, which begins the new year on the winter solstice. They measure age in years, and birthdays are typically celebrated in grand fashion. The grandest galas are held when young ladies reach the age of sixteen, and their families throw extravagant parties to debut their daughters to the eligible suitors of the Rishi. While guests of all ages are invited to these debuts, men are not considered eligible suitors unless they've reached the age of twenty and have established some means of long-term wealth acquisition. For the firstborn, their promised inheritance of family land is enough. For others, a successful forge, trade route, or lofty employment under a firstborn sibling is required for a man to reach adulthood. Marriage is a common benchmark of adulthood for women, but owning a successful ranch or business is a well-respected and not-uncommon alternative. Gryphon riders are the guardians of the Rishi Plains. They live in rookeries, secluded towns devoted to the rearing and training of gryphons for mounted flight. While anyone is welcome to join the rookery, individuals are not considered gryphon riders until they receive their own gryphon hatchling to raise. Within the rookery, riders learn to care for their gryphons as well as ride in a number of strategic formations. Some riders practice in-flight archery, but most riders use magic as their mode of offense. Because gryphons live up to two centuries, gryphon riders never officially retire, though elderly riders abstain from participating in mounted formations and typically take up a position of mentorship within their rookery. Gryphon riders of all ages are revered by the rest of the Rishi, and plains elves are especially eager to offer deference and aid to any rider they encounter. Though the plains elves of the Rishi have spoken the lingua franca of Allanic for centuries, their local dialects and traditional names harken back to the elvish tongue of Ka'e, which originated in the mountains to the north. The plains dialect is easygoing and lilting, rife with casual grammar and phonetic elisions that sound almost lazy to a northern speaker. They still write using their ancestral alphabet of angular runes, which has become the most common written form of Allanic, and the plains elves tend to gesture during speech more than their mountain cousins do. Gryphon riders also use a language of hand signals to communicate across winds during flight, and some of the most common signs have worked their way into the gesticulations of the layfolk. In the book Awakening, Sharis and Fal'on are gryphon riders hailing from the plague-stricken rookery of Vedosr'f'n. As nomadic barterers with no home to return to, this sister-brother duo traveled the plains until they encounter an ethereal pair of wraiths hailing from the distant land of Kholl. Overhearing their plot to mindwarp the empress and overtake the imperial capital for their own, Sharis and Fal'on embark on a reckless journey to find help for the empire. Instead, they pitch headlong into a perilous quest three centuries in the making.